Photo: Our staff goes into rural schools to train girls in ways to avoid the common tricks and traps of the traffickers. We are happy to report that we have continued our trafficking awareness counseling classes for girls ages 14-18 in about 4 different schools a week. We have been reaching 500 girls monthly through our training classes which are styled in a workshop and discussion format, and we also reached hundreds more at our border counseling station. All of the teachers and students are thankful for our trafficking awareness program which allows the girls to talk about guilt, fear, shame, anger, and their safety — they are encouraged to open up and learn from each other’s experiences. They are also taught to identify different problems and dangerous situations, and they are given the solutions. They are taught to stay away from strangers, to know the difference between true love and flattery from a stranger, to stay away from the lure of promised money and employment, to not exchange phone numbers or other information on Facebook, to understand their own responsibility towards their family and community, to focus on studies rather than jobs, money, and entertainment, how to develop self-dignity and respect, and to know the laws and punishments regarding human trafficking. In other news, the girls at our trafficking rehabilitation home are doing very well — we have 18 girls enrolled in our program, which is our highest enrollment since the launch of the ‘She Has Hope’ program in 2011. They are healthy and happy, learning to make a ‘Redima dress,’ which is popular among Nepalese women. They are also learning to make embellished plush elephant keychains and wood beaded necklaces, which we are selling online at the She Has Hope crafts shop where all of the profits go toward the girls’ rehabilitation. 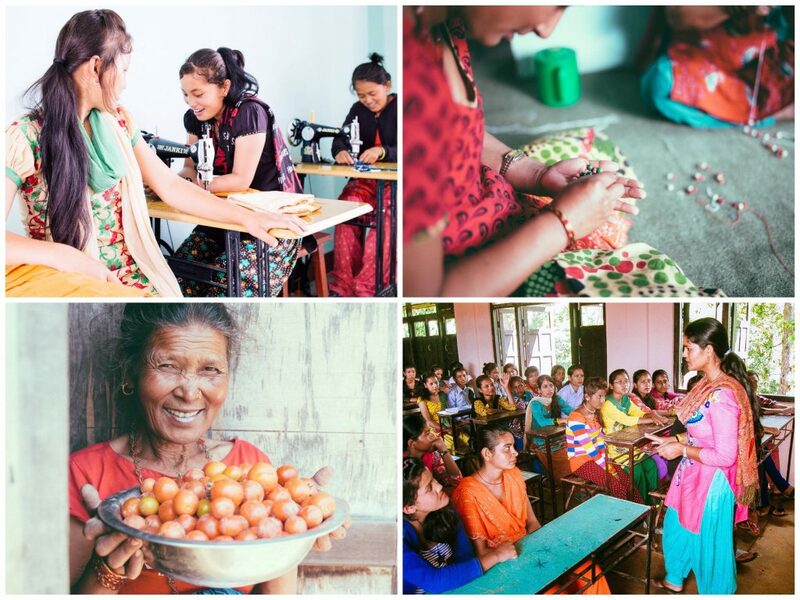 Photo inset: (Top-left): Girls in our rehabilitation home enjoy time together in their sewing class. (Top-right): Jewelry-making is one of the many skill development courses the girls in our rehabilitation home become proficient in before graduating from our program. (Bottom-left): Our hard-working farmland staff member proudly shows her harvest of fresh, organic tomatoes. (Bottom-right): A member of our native team teaches trafficking awareness to a class of local teenage girls. We aim to equip girls enrolled at the ‘She Has Hope’ home with everything they’d need to know to stand on their own, healed and full of hope. Our garden project at the rehabilitation home continues to flourish — we recently planted cauliflower, spinach, and tomatoes, and we expect to glean a harvest in November or December. Last month’s profits from the garden came to a total of $28, which is impressive since the garden is small and that amount is equivalent to one month’s wages in some parts of Nepal. The garden project not only provides the girls with nutritious ingredients for their meals, but it also equips them with the understanding of advanced gardening techniques. They leave the home with knowledge of how to start their own gardens to provide for themselves. Our farmland project also continues to thrive — in August we harvested 881 pounds of corn, which has been stockpiled in one of the storage sheds at the farm to be used for the goats’ feed for several months to come. By doing so, we saved $113 — growing our own goat feed further increases the profitability of our farmland. Our goat farm project is also doing well — it is currently raising about $3,000 annually. Our 34 goats are valuable assets as they are raised for stockbreeding. Surplus from the farmland is sold at market to generate much-needed funding for our programs. With your support, we hope to expand our Nepal farmland project in the future, to further our work of growing toward sustainability. Our children are also doing well, back in school which resumed in June — the start of the school year was delayed by the earthquake. We are thankful that all 24 of our orphan children are enrolled and learning math, science, English, computer skills, social studies, and health education. As always, thanks for your prayers and generous donations, blessing the lives of our children, our girls, and our native team in Nepal.